If you are one of the many Keurig users in the area we have good news. Our own Kristi brought in her roommates (thanks Michael and Nicole) Keurig unit and Peter C. brought us a My K-Cup and the experiments began! In case you've just awakened from a coma, the Keurig is a coffee brewing system that passes 192 degree water through a needle that pierces a pre-proportioned plastic cup (K-Cup) that contains finely-ground coffee for about sixty (60) seconds. There are two (2) volumes to choose from small yields 7.25 ounces and large 9.25 ounces. The result with either size is a single cup-o-coffee. The limitation is the choice of coffee and one could imagine the freshness of the K-Cups could be questioned also. Enter hypno-customer Peter, who gave us a My K-Cup and a request to figure out why when he uses the My K-Cup he gets sub-par results. First we measured the capacity of the screen insert; about 13.5 grams. While checking out the capacity we noticed the mesh of the screen seemed pretty big, meaning too finely a ground coffee would put a lot of "silt" in the cup creating a bitter experience. The other notable feature about the screen is its small diameter, about the size of a half-dollar. Combine the small basket with a short extraction time and if the grind is too coarse you'll wind up with under-extracted, sour, and weak coffee. 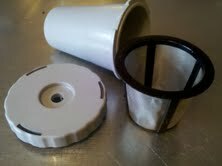 We used the Hario Skerton hand-grinder because it does a good job, and has very repeatable settings. We started by setting the grinder to 0, which means the burrs are touching and the handle can not be turned, then turning the adjustment ring counter-clockwise and counting the indentations we set the grind to" 4", which is the setting I use for the Hario V60 pour-over cone. We chose the small cup size (7.25 ounces) which is the closest we can get to our desired ratio of two grams of coffee per ounce of water. The result was weak, but close for a first try. Next, we use a "3", which yielded a decent cup with less silt that a french press. Naturally, we tightened the grind to "2", and that finally went too far, the cup was "muddy" and bitter. Back to "3" and then we did a comparison to our normal Hario pour-over using the same ratio of 13 grams to 7.5 ounces of water. The Hario cup, although more watery than normal, possessed more sour notes, and a longer finish than the Keurig cup did. This isn't to say the Keurig is bad, it isn't, it just doesn't have the complexity that the pour-over does. Was the more muted cup caused by the water being only 192 degrees, the small diameter of the basket, or the small ratio of coffee to water? Yes, probably all of those. Keurigs fill the niche of easy fast coffee for folks that don't like to fuss in the morning with their coffee, and now the experience can be even better. Not only can you use our fresh coffee, but also feel good about not producing that extra plastic waste everyday by using the My K-Cup reusable insert. We'd be glad to demo this for you anytime (the Keurig is still in the shop this week at least).